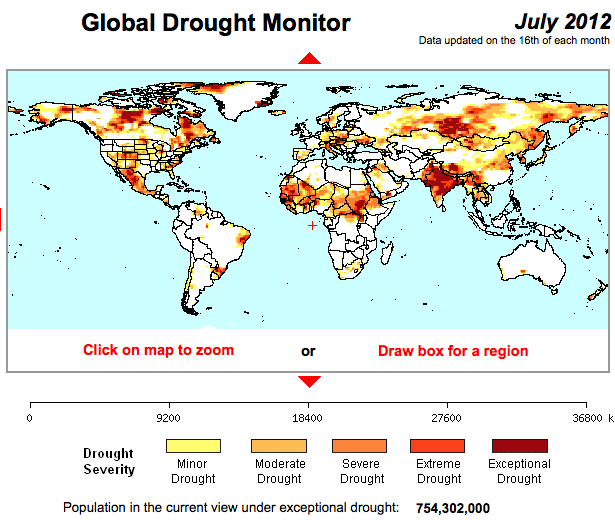 In addition to the ongoing drought in the United States, experts warn that the potential for a worldwide food crisis is heightened by extreme and erratic weather across the globe. 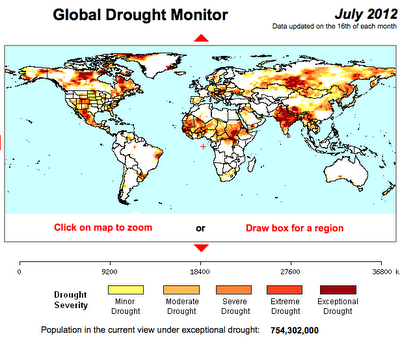 The drought gets worse: The US Drought Monitor reports that areas on the nation under extreme drought conditions in key agricultural states has tripled in the past week. Furthermore, the amount of land experiencing drought conditions more broadly has increased to nearly two-thirds of the nation, up from 56% just a week ago. The Berkeley Earth Surface Temperature Study (BEST) is poised to release its findings next week on the cause of recent global warming. For years China has dismissed concerns about its rising carbon emissions by pointing out that, on a per-capita basis, Chinese citizens still emit far less than their counterparts in the industrialized world. But now that China’s per-capita emissions are on par with those of the European Union, that argument will be much harder to make. There’s a dà xiàng in the room when it comes to addressing climate change. Dà xiàng is mandarin for elephant. And if you want to get your head around the latest data on greenhouse gas emissions, you’ll need to look to China. Over the last few months I’ve had the privilege of listening to a range of leading climate change policy advocates in Australia, the US, Canada and Europe reflect on priority actions for reducing the risk of runaway climate change. 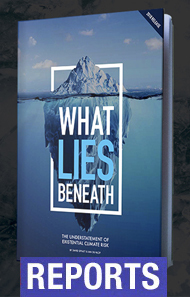 This has included interviews with many of the lead authors of the strategies reviewed in the Post Carbon Pathways report. 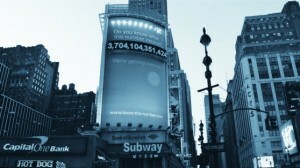 In this Post Carbon Postcard #2, written from New York City, I’d like to highlight a few of their responses to two of the most common questions in the minds of people who have been working on climate change and environmental issues for many years: Is it too late? And...So what should we do now? 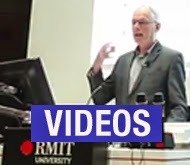 The first part in this series described some characteristics of the climate debate and the climate action advocacy movement in Australia. 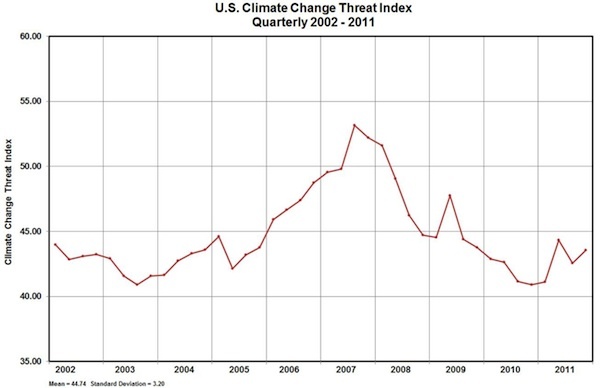 In the USA (and Australia too), concern about climate change (as measured by the climate change threat index - see chart below) peaked around 2007. Research studies find that media coverage of climate change directly affects public concern levels, and that the actions of political elites turn out to be the most powerful driver of public concern. 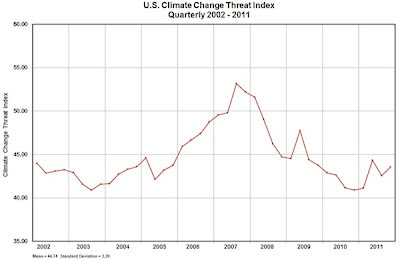 Concern in the USA was at its heightat the time of media focus on the IPCC’s 2007 fourth assessment reports and Al Gore’s “The Inconvenient Truth”. 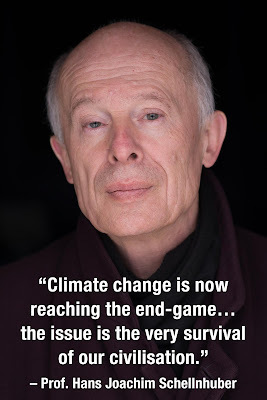 ABC’s Bill Blakemore has a 5-part interview of the most vindicated climate scientist in America, Michael Mann. All 5 videos are posted below with links to their transcripts. In the last five years, Australia has signed the Kyoto Protocol, legislated a price on greenhouse gas emissions, established a Clean Energy Finance Corporation (CEFC), and more than doubled the Renewable Energy Target (RET) to 20 per cent of electricity production by 2020. The Contracts for Closure of around 2GW of dirty coal power is due to be resolved soon. 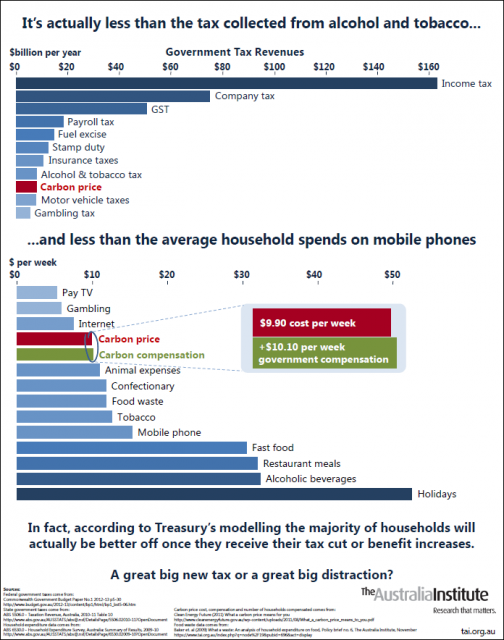 Household electricity demand is falling and the wholesale price has dropped substantially. Energy efficiency measures, installed household solar PV and higher prices have already reduced demand by the equivalent of Hazelwood power station’s full capacity. The Greens’ vote and influence has increased, the Transition Towns and sustainability movements are growing, and a formidable community campaign against coal seam gas is gaining significant political power. 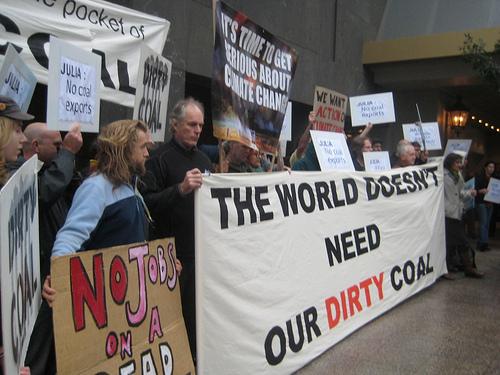 The coal industry in Queensland is a hot topic. The cost of renewable energy, especially PV solar, is falling quickly and household rooftop solar is already grid competitive. Community support for replacing dirty fossil fuels with clean, renewable energy is strong. Under its Clean Energy Future, the Federal government will negotiate to close 2000 MW of the dirtiest fossil fuel power generating capacity in Australia by 2020. 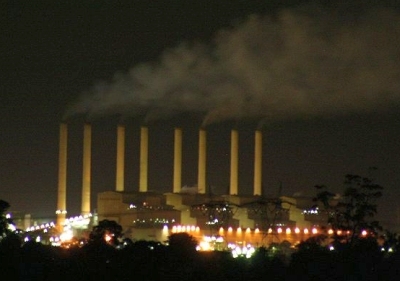 With the price on carbon now in operation, there will be pressure on some highly carbon intensive station to remain viable – this policy pre-empts the failure of the most vulnerable businesses and provides some certainty as to which stations will close, as well as compensating the companies affected, including the workers who will lose their jobs. The plants under consideration are Hazelwood, Yallourn and Energy Brix in Victoria, Playford B in South Australia and Collinsville in Queensland. If you want to mislead people into thinking that there is nothing weird going on in the Arctic, you have to do it during winter. In winter things almost look normal on some graphs, with gaps between trend lines and long-term averages not as ridiculously big as during spring and summer. If you’re lucky, anomalous weather patterns can make those trend lines come real close to the long-term average, and you’ll have a couple of weeks of shouting ‘recovery’, ridiculing scientists and suggesting graphs are being cooked. It’s an annual ritual on pseudo-skeptic blogs, which is only logical. The Arctic is becoming ever more problematic for their life work, i.e. denying AGW could ever be a problem and thus delaying any meaningful action on mitigating the consequences of AGW. Thank God water still freezes in winter. "If we do not raise our sights and ambitions, then we are guaranteed to fail. Itʼs a tough but simple choice and if we continue down our present road, we will leap from foggy thinking into pure madness, there being no other means of keeping reality at bay." If we accept the worst, or precautionary assessment, then US environmentalists have perhaps a year to avert cataclysm and nothing we are doing now will work. We are dealing with this terrible situation in a very ordinary and human way, by denying it. Our denial comes in a variety of forms: we believe that President Obama can and will solve the problem; we ignore Jim Hansenʼs assessment and timeline; we concentrate on our jobs and organization agendas and pass over the big picture; we focus on the molehill of climate policy rather than tackle the mountain of climate politics; we assess our efforts by looking back on how far we have come and do not measure the distance still to be traveled; we scrupulously avoid criticizing each other, lacking conviction in our own courses of action and not wishing to invite criticism in turn; and we are irrationally committed to antique approaches that are self-evidently inadequate.